Airplane nuts in Oshkosh? I have to admit, this page belongs on our sister site, Antique-Airplanes.com, but you might want to know about it because we're always looking for reasons to travel... right? The last week of July every year, pilots and airplane lovers from all over the world converge on this little town. Its rural airport becomes the busiest airport in the world. I know that's hard to believe... but just look at the tower. 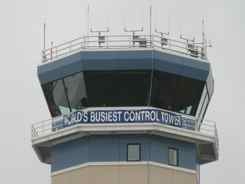 It even has a banner that says "World's Busiest Control Tower". "The Greatest Aviation Celebration in the World." If you love airplanes, you really should plan to make it to Oshkosh some day. It's busy because so may pilots love to fly in. We fly commercially and drive in, but pilots always think it's a thrill to fly to Oshkosh. Part of the fun of Oshkosh is to tune into the tower frequencies and listen as the controllers bring planes in to land.... two and three at a time It sounds like chaos, but everything is always under control... if somewhat unconventionally. The controllers don't want aircraft identification numbers... just colors and types... they are too busy. They just want to see you and get you down. Coming in on final, they want to make sure they have the right plane, so they'll ask you to "Rock your wings for Oshkosh". There is a second runway and tower frequency they use for larger and faster planes, though the main runway sees plenty of those. Everywhere you look there is something taking off or landing.... there's always something flying. We love all this stuff... we go every few years. They have everything from ultralights to antique airplanes to warbirds to jets. Aviation fans are there because they can see all the newest planes available for private pilots. They can check out restored antiques and "warbirds". There are businesses selling corporate jets. Vendors are selling airplanes parts and fun "extras" if you have your own plane. We wrote about our Cub to Oshkosh adventure when we helped take a Piper J-3 Cub from California to Oshkosh. It took us a week to get it there... A Piper Cub doesn't fly very fast! Everyone thought we were nuts sure! If you want to stay in a hotel, you'd better have reservations well in advance... like a year ahead.... many of those airplane nuts in Oshkosh return every year. Pilots can camp with their airplanes in a parking area adjacent to the AirVenture show grounds. Pilots or anyone can stay in Camp Scholler adjacent to the airfield. There is a small store in the campground, and the EAA runs shuttles to grocery stores and nearby shopping malls for all possible needs. There's lots of food available on the field including breakfast and dinner, and it's better than most airshow food. So if you love airplanes, and you've always wanted to go... why don't you plan to get to the EAA AirVenture one year... you can be one of those airplane nuts in Oshkosh too. 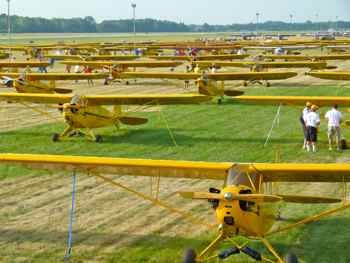 You can read a whole lot more about antique airplanes in general, and Oshkosh... start at our Antique Airplanes page on Oshkosh.